My movie buddy went to see “Gone Girl” with her book club, so I recruited a professor friend of mine to see “The Liberator” with. I figured I’d pick up some background on the history of South America, and I was right. We liked the movie and then had a rich series of arguments based on its ideas. The life of Simon Bolivar, as far as I know, hadn’t been available in the form of a modern big screen movie before. They made an epic of it with “a cast of thousands,” probably computer generated, but who can tell? Smoke and blazing guns, people dying, dismembered limbs flying, peons’ pitchforks against soldiers’ bayonets, horses falling, noise and confusion, battle scenes. The stories of Bolivar’s personal life are threaded in quick visuals between tense scenes of war. His personal passions are not ignored, but they are far outweighed by the torrid torments of his political and military life. 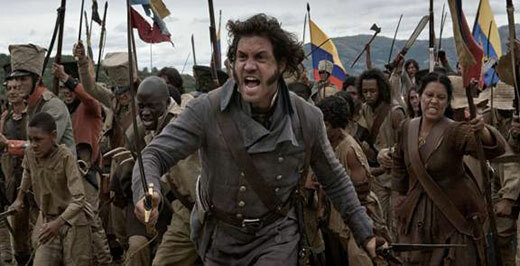 Bolivar is told, early in the film, the two basic obstacles he must overcome to realize his dream of a united and independent South America. The first, of course, is imperial Spain with “the best soldiers in the world.” The second is the diversity of Black, Brown, and European; rich and impoverished, free and enslaved, people. The movie mentions the major influences of the U.S. and French revolutions. It emphasizes the role of the English in financing Bolivar’s campaigns, but it skips over the influence of revolutionary Haiti. Wikipedia says that Bolivar commanded Haitian troops when he began the end of South American slavery in 1816. Even with a run-time of almost two hours, Bolivar’s continuing influence in the world cannot be fully presented. 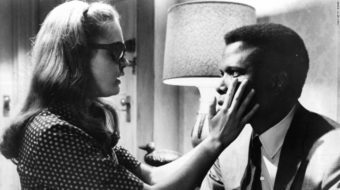 The major weakness of the film is that it tries. In consequence, the movie seems chopped up, like most biopics, into short explanations of major accomplishments. Bolivar had too many accomplishments to cover that quickly. Four or five separate films would have been better.